For generations of New Yorkers, the Rockaway peninsula was as much a summer destination for the thrill of roller coasters and other amusements as Coney Island is today. But no other place on the peninsula set the imagination afire as much as Playland, a celebrated amusement park that lasted over 80 years and "symbolized the glory days of Rockaway Beach as a tourist mecca" during the 20th Century. Famed for its Atom Smasher wooden roller coaster, featured in the 1950s film "This is Cinerama," Playland endured until the early 1980s. "When I turned 12, my world opened up when I was given permission to visit Rockaways' Playland, a glorious amusement park on Beach 98th Street," recalled Edward Rohs in his memoir "Raised by the Church: Growing Up in New York City's Catholic Orphanages." "Even the entrance was thrilling -- a huge grinning clown face that promised untold joys. Visiting Playland gave me a giddy sense of freedom." La Marcus Thompson, who introduced the first roller coaster at Coney Island, established what would become Playland as the L.A. Thompson Amusement Park in 1901. The park was sold to new owners in 1928, who renamed it Playland and brought in new rides including a roller coaster and a 165-foot-long swimming pool that would later be used for Olympic trials. With the end of direct rail connection to the peninsula in the 1950s, the Rockaways were no longer New York's "favorite beach resort" and Playland suffered. Demographics changed, and fewer people went to the amusement park each year. An attempt at a turnaround with new owners in the early 1980s was short lived. By 1986, the Atom Smasher had been demolished and insurance rates were so high that the owners felt they had no choice but to shut the park down. Here are rare photos of Playland from the 1950s to the 1980s, showing the fun and excitement at one of the city's last large amusement parks -- and its eventual razing to make way for a development. 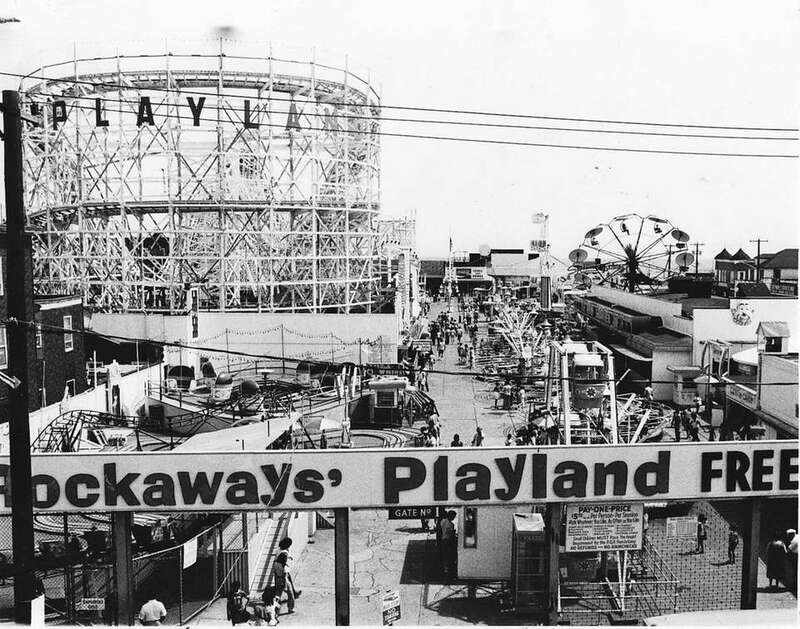 Rockaways' Playland is seen in this undated photo. A clown sign, seen on July 29, 1977, points the way at Rockaways' Playland. Two women try out this Rockaways' Playland ride on July 29, 1977. Visitors sample the attractions along the midway at Rockaways' Playland on July 29, 1977. Richard Geist takes in the view of his Rockaways' Playland on July 29, 1977. Maintenance man William Dauth, of Brooklyn, tightens nuts and bolts on roller coaster ride from the top of Rockaways' Playland on July 29, 1977. Tillie London and her granddaughter Jodi Geist work at the ticket counter at Rockaways' Playland on July 29, 1977. Mechanic Michael Magro, of Rockaway, works on the merry-go-round at Rockaways' Playland on July 29, 1977. People leave the elevated train at Beach 98th Street, the Rockaways' Playland exit, and head for the beach on June 25, 1978. People ride the roller coaster at Rockaways' Playland on July 3, 1979. The roller coaster at Rockaways' Playland gives a view of the neighborhood below on July 3, 1979. John Miller, of Rockaway Park, Queens, polishes up clown face at Rockaways' Playland at the pre-grand opening on May 16, 1984.